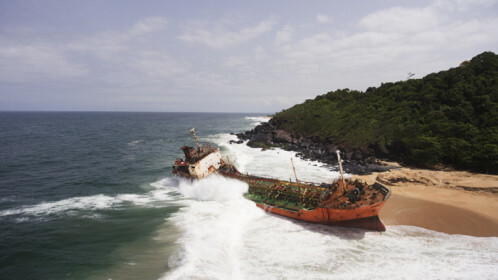 In the coastal city of Robertsport in Liberia the ‘Tamaya 1’ – a fishing boat – has been found on the beach. How it arrived here is quite a mysterious story. Yet, since May it has been transformed into a piece of art thanks to a tape figure inspired by the personages of Mark Jenkins. American artist Mark Jenkins is renown for his faceless sculptures exclusively made out of transparent tape dressed with garments and disturbingly resembling to human characters. It is this technique that Jenkins passed onto Liberian surfers so that they can realize one of his sculpture. 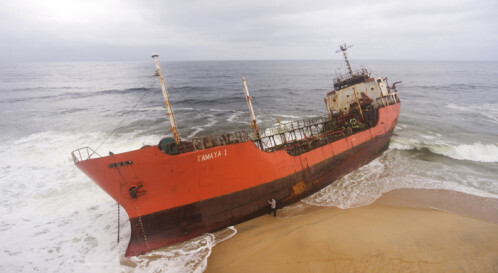 The tape figure imagined by Jenkins seems like pushing the ship back into the ocean. The art piece is not made to last as strong swells are often shaking it. This fact inspired the name of the work: Figure VS Nature. 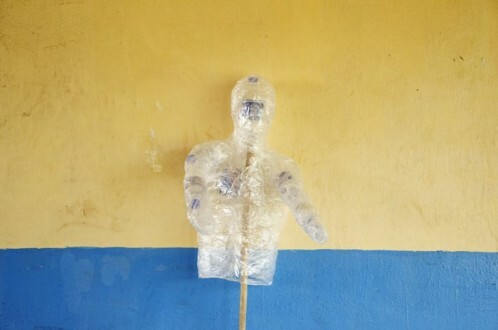 Yet, this sculpture should be the first one of a long series as the local Liberian team learnt how to work with this tape technique invented by Jenkins.